Kale, Salad, Hearty Greens, Turnips, Sweet Peppers, Broccoli, Radish, Garlic, and Tomatoes. 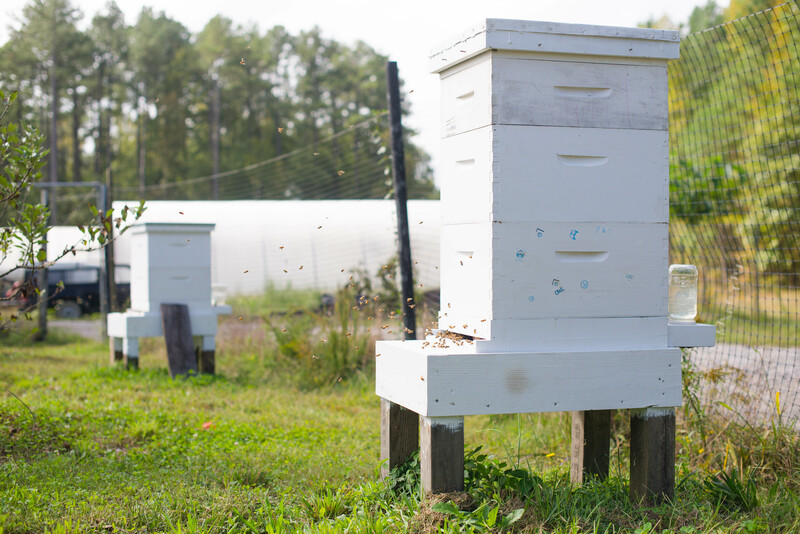 You can really see the bees coming in for a landing at the entrance to their hive! The bee below is thirsty and drinking a drop on the lid of the jar. Kale and broccoli are pictured below, which we are so glad to be handing over to our beloved farm shareholders this week. 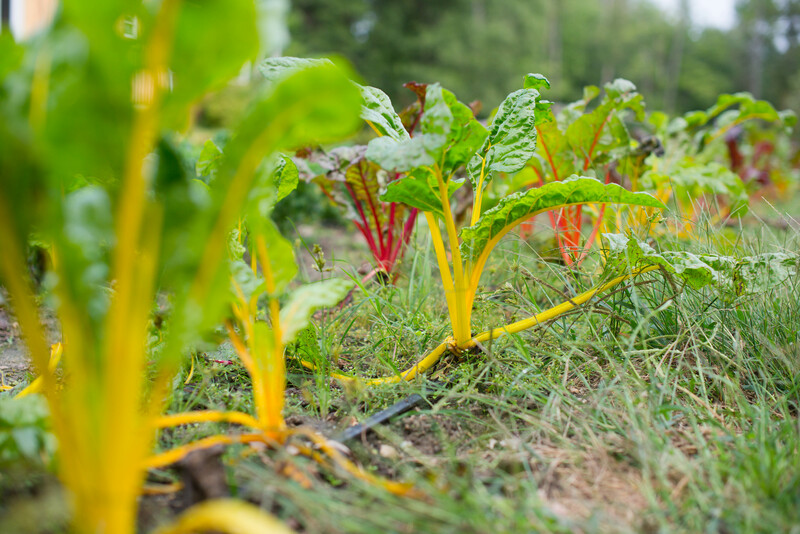 This swiss chard is called “bright lights” for a really good reason. Cabbages are coming in. We are growing both a traditional round variety as well as our favorite Chinese variety. 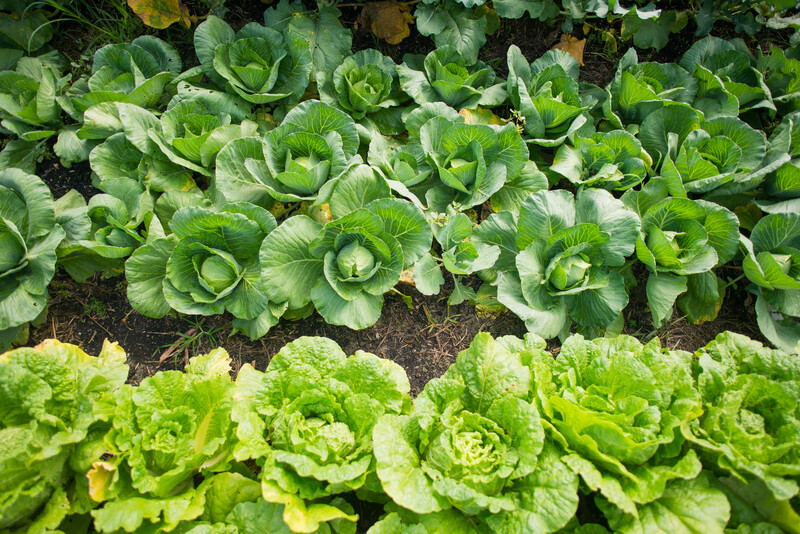 Saute it with protein, make a slaw, make tacos, make kimchi….we can’t imagine fall without cabbage. We hope you embrace it like we do. Despite the fall being well underway and winter approaching, seeding is still happening here. (And with a smile from Kyle!) 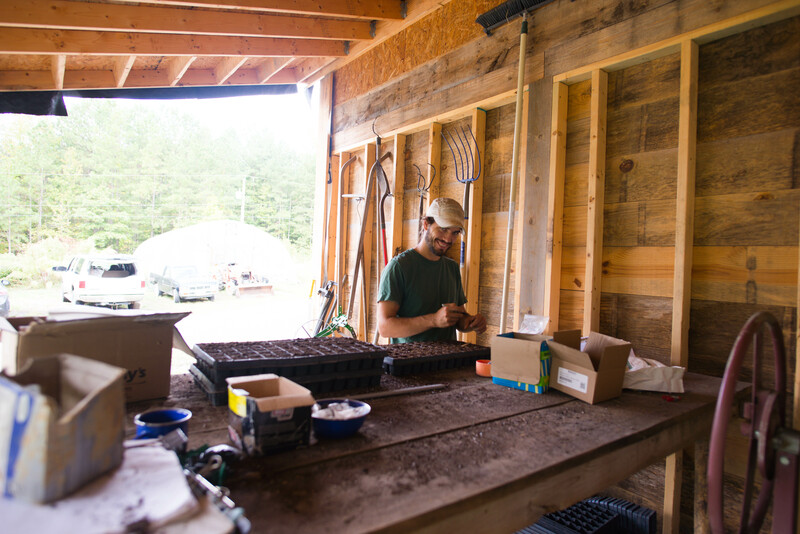 We will continue to grow in our greenhouse and high tunnels for much of the winter. 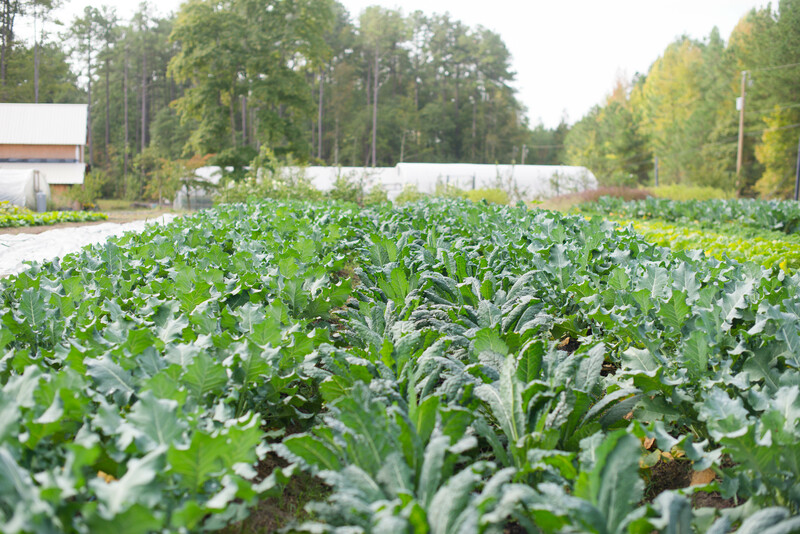 Our harvests will be smaller, but really good food will still be produced for our community. The high tunnels are still lush, and the tomatoes still producing, though they were definitely hurt by the solid week of clouds. The tomatoes that we are harvesting right now have an ugly spotting on them that we have yet to understand. (We are selling them as seconds this weekend due to the damage.) 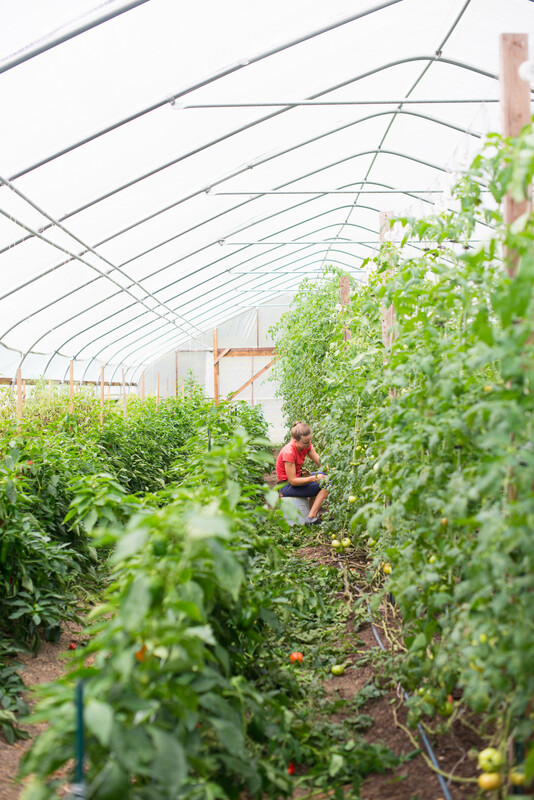 Below, Rachel is pruning, lowering, and leaning the plants, as that is how we manage these old-growth tomato plants that spend so many months living in this structure. Kale or Hearty Greens – This weekend we fell in love with this recipe for Hardy Greens with Lemon-Garlic Vinaigrette. The photo on the recipe page shows the leaves with the dressing simply poured over top, but we prefer to massage in the oil and juice and flavors. Put your hands in the bowl and massage those greens! If you lose a ring in the process, retrieve it from the bottom of the bowl. Salad – We are diggin citrus-based homemade dressings right now, like this Citrus Vinaigrette recipe. This allows all 5 eaters in our family to love salads for lunch and dinner, almost every day. Sweet Peppers – Roast them, slice them on salad, dip them in hummus, fill them with goat cheese…they are versatile and delicious. Broccoli – Please remember that we don’t kill bugs on our broccoli plants and there are most likely small green worms hiding inside your head of broccoli. A simple salt-water soak easily takes care of the unwanted pests. This website orients you to the process very well. Our favorite way to eat broccoli is Roasted. Arugula, Beets, Broccoli, Cabbage, Chard, Eggplant, Garlic, Hearty Greens Mix, Kale, Lettuce, Okra, Peppers, Radish, Salad, Tomatoes…and our Organic, Naturally Leavened Bread. 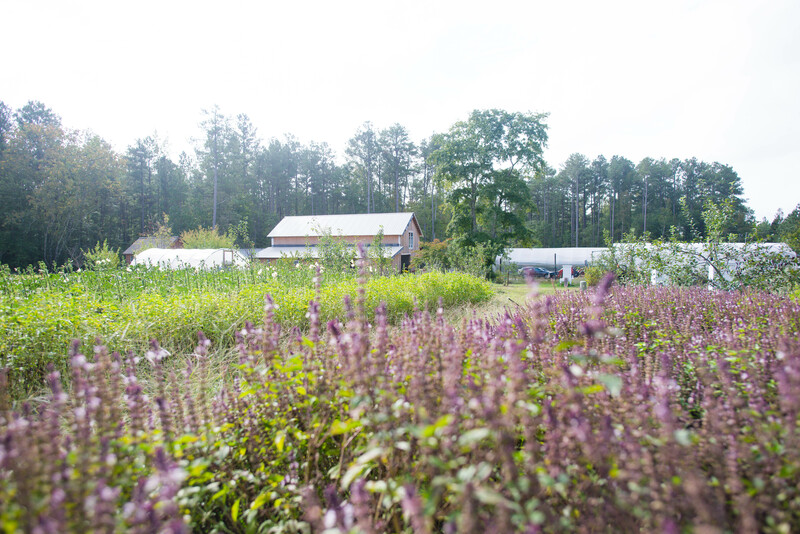 2015 Market Share CSA Members: Reserve your selection online to pick up on Saturday, October 10 at our farm, the Brandermill Green Market, The Market at Magnolia Green, or the South of the James market.